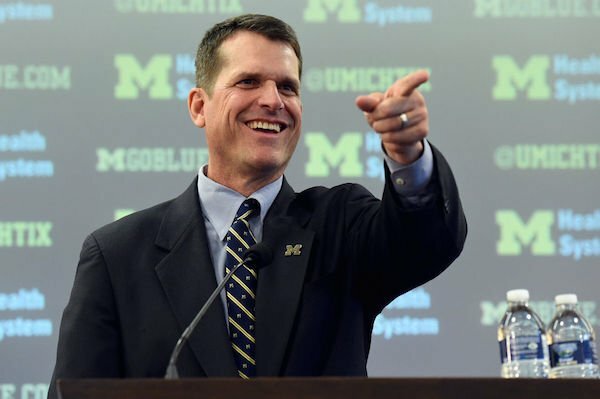 Ann Arbor, Michigan, put your hands together for one of the most energized, fearless, hardworking and competitive coaches in all of football: Jim Harbaugh. To all the Michigan fans, make sure the Big House stadium stays rocking in the 2015 season. It is time for a new era, and I guarantee you that Michigan Wolverine football will be restored under the hands of Harbaugh. Harbaugh turned around a 1-11 Stanford football team and made them relevant again in college football. In his last season as the Stanford Cardinals head coach, his team went 12-1 and won the Orange Bowl. Imagine what he could do with the Michigan football team he’s inheriting. I’d be excited to be a Michigan fan right now because coach Harbaugh loves to take on a challenge. Again, he’s already turned Stanford from a nobody into a somebody. The University of Michigan has a rich tradition which includes: touching the banner, the temptation beat and the tunnel walk. The banner touching started in 1962. The “Temptation” beat is played when the Wolverines make a huge stop on a third down. Moreover, the school holds 11 national titles, 42 conference titles and three Heisman trophy winners. New Michigan head coach Jim Harbaugh knows he’s on a mission and winning eight or nine games every season will not cut it.